We were discussing the basics of shear stress in turbulent flow, minor head losses in pipe flow, hydraulic gradient and total energy line, basic concept and working of syphon, flow through pipes in series and also the concept of flow through pipes in parallel, in the subject of fluid mechanics, in our recent posts. Now we will go ahead to see the, flow through branched pipes, in the subject of fluid mechanics, with the help of this post. Flow through branched pipes could be defined as the fluid flow through a piping system where three or more than three reservoirs will be connected with each other with the help of pipes and will have one or more than one junctions. Now we will see here one figure as displayed here. Three reservoirs are connected here with the help of piping system and this piping system and reservoirs are connected with one single junction i.e. 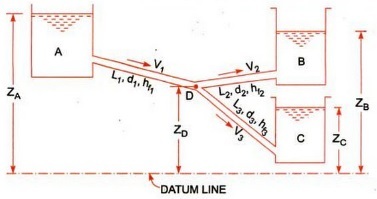 junction D.
In various branched pipe flow problems, we will have some specifications of branched piping system and usually we will have to determine the flow of fluid through each pipe. Let us assume that we have information about the data for length of pipes, diameter of pipes and coefficient if friction for each pipe and we need to find the data for flow of water through each pipe. Let us assumed that reservoirs are very large and levels of water surface in the reservoirs are constant in order to secure the steady conditions in the pipes. We have also assumed that minor losses are very small and could be neglected. We will have to recall the following principles and we will have to use following equations for securing the desired data for such problems. Let us consider that three reservoirs are A, B and C and piping system will have pipe 1, pipe 2 and pipe 3 and a single junction D as displayed above in figure. Flow of water from reservoir A will take place to junction D and flow of water from junction D will be towards reservoir C.
Flow of water from junction D to reservoir B will only possible if piezometric head at D will be more than the piezometric head at B. Let us now use the concept of Bernoulli’s equation for flow from A to D and we will have following equation as mentioned here. Let us now use the concept of Bernoulli’s equation for flow from D to B and we will have following equation as mentioned here. Let us now use the concept of Bernoulli’s equation for flow from D to C and we will have following equation as mentioned here. Now we will use the concept of continuity equation and we will have following equation as mentioned here. Now as we can see that we are having with above four equations and we have to secure the value of V1, V2 and V3. We will use above four equations to secure the value of flow of water through each pipe. Further we will go ahead to find out the basic concept of power transmission through pipes, in the subject of fluid mechanics, with the help of our next post.